Why Do I Build These Things? I flunked out of graduate school twice, in Physics. (I discuss this in my statement about Attention Deficit Disorder.) While I was there, I was working on organic dye lasers, which are amusing but rather messy devices. I designed and built several flashlamp-pumped ones (perhaps as many as a dozen), but all of them left something to be desired. After building several nitrogen lasers, including one that lased nitrogen at room pressure (nontrivial, as those who have tried it can attest), I got back to thinking about flashlamp-pumped organic dye lasers. Eventually I produced a flashlamp-driver design that I could build with nothing more than a Dremel Moto-Tool, because that was about the only machine-tool I had access to. Granted, it used a commercial spark gap as a switch (there are, after all, limits to what one can do with hand tools, though it’s possible that one might make a decent switch for 30,000 volts, given the right materials and enough time). Not, perhaps, very pretty, and maybe not portrayed as clearly as I’d hope; but nonetheless, effective: this particular design eliminates the major shortcoming that plagued all of my earlier drivers. In fact, it exploded the first two flashlamps I tried in it, in two shots apiece, at just below the lowest rated voltage of the switch. (Sigh... at least it validated my conjecture that it would be relatively fast...) I was forced to resort to capillary lamps (you can see the lamp up toward the top, in the rear), which slow down the discharge considerably. Even slowed down, however, it works well enough to lase fluorescein or Rhodamine 6G with only the reflectance of the end-windows of the dye cell for feedback: no external mirrors are required. (Those who have tried this particular trick can tell you that it, too is not entirely trivial.) I have, just recently, acquired a reasonably fast oscilloscope (Tektronix 7904, with 7A19 vertical and 7B92/7B92A horizontal plugins, all out of date and all representing the joys of surplussage), and I hope to make some measurements of the risetime and pulsewidth of this device in the not-too-distant future. This lamp driver is a grossly asymmetric version of what Papadopoulos and Serafetinides (see the reference at the end of this page) call a doubler circuit, but might more formally be described as an LC inversion circuit. The main energy storage is provided by a Maxwell capacitor that is rated 0.089 microfarad at 75 kV (The tall white thing just right of center in the photo), and the secondary store is a pair of 3.6 nanofarad barium titanate ceramic "doorknob" capacitors in series, so they add up to 1.8 nanofarads (the two darkish red cylindrical objects below the spark gap switch, which is the white cylindrical object on the left side of the Maxwell cap). That represents a ratio of almost 50:1. The smaller capacitor serves to initiate conduction in the spark gap quickly and thoroughly, which abruptly overvolts the flashlamp, turning it on very firmly. It is conceivable that the doorknob/switch side of this circuit "rings down" somewhat to a negative voltage, thus turning the lamp on even harder than the power supply voltage (typically about 30kV) otherwise would; but I don’t know. That was certainly my intention; measuring it, however, is another story. It is not trivial to instrument these things! Note: Unfortunately, as of late 2016 I am unable to find the image file. I will restore it when and if I can locate it. Sometimes I wonder why I do these things; in the past, I have built them because... well, because I wanted to see whether I could, because I’ve always been fascinated by fluorescence and by ultraviolet light, and because there is something very odd about a pulse of light that is only about as long as a broomstick, or a laser that is tunable across a substantial fraction of the visible spectrum, as some dye lasers are. As I say, the laser I’m about to build is a tool, but that isn’t usually the case; or perhaps it would be better to say that I typically use them as generalized learning instruments. You can learn quite a bit from a broomstick, if you pick your broomstick carefully. 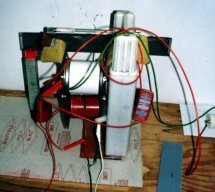 [Note, added in 2005: I have even published a reasonable design for a modest nitrogen laser that uses parts and materials from the hardware store where possible, and from eBay or a surplus outlet.] There are also other DIY-able nitrogen (and dye) laser designs in various places. Email: my first name (only 3 letters! ), at the domain you can see in the URL of this page.